10 | June | 2015 | Study. Read. Write. 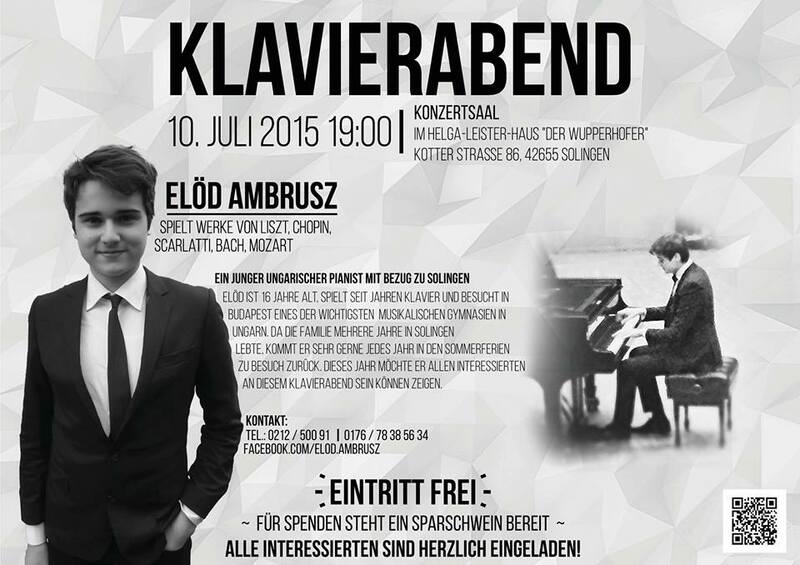 If you’re in Solingen, Germany on July 10, and you like classical music, you’re invited to come and see 16-year-old pianist Elöd Ambrusz perform! Elöd is one of Hungary’s most talented young pianists and will be playing works by Chopin, Liszt, Mozart, Bach and Scarlatti – for FREE. I have known Elöd Ambrusz since he was little, and I can’t wait to hear him play now. I remember a time when my gran would take him to a nearby nursing home because it had the only freely accessible piano she knew of and he always had a willing and appreciative audience. He has come a long way since then, attends one of the most prestigious music conservatories and secondary schools in Budapest, and even competed in a national, televised talent show for young classical musicians. Many people in Solingen have helped Elöd find opportunities to play the piano whenever he’s here on family holiday, so this performance is his way of saying thank you. All lovers of classical music are invited. Entry is free, although donations are welcome.